The Ferry Building may have trouble keeping people indoors but the upscale waterfront market knows how to put on a farmer's market. No list of farmers markets could be complete without mentioning this titan of the food world. 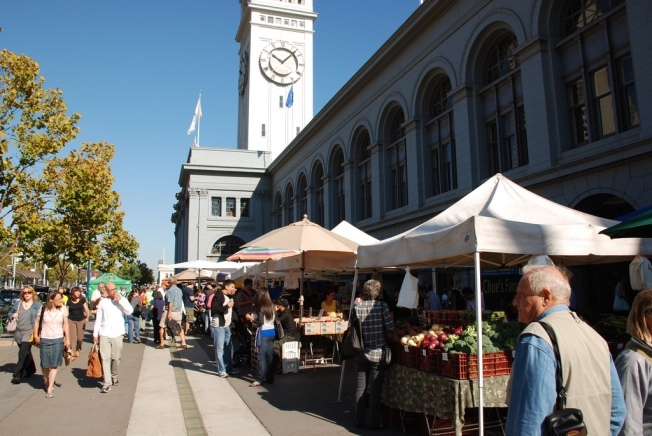 Ground zero for the birth of slow food and much of the current revolution in local, organic eating sweeping the nation, San Francisco and the Bay Area is king and its historic Ferry Building and nearby Plaza Farmer's Market is the capital building. Stop by for delicious favorites like locally produced cheeses, more mushrooms than you've ever seen and some tasty gelato. The market is held every Tuesday from 10 a.m. to 2 p.m.
on the foot of the Ferry Building and spilling over onto the Embarcadero. On Saturdays, the market spreads its wings and pulls in more local farmers and ranchers starting at 8 a.m. and running to 2 p.m.